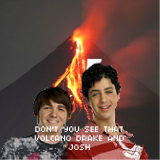 Based on this image, you must prevent Drake and Josh from making the ultimate sacrifice. Oh god this is my first attempt. Be gentle.